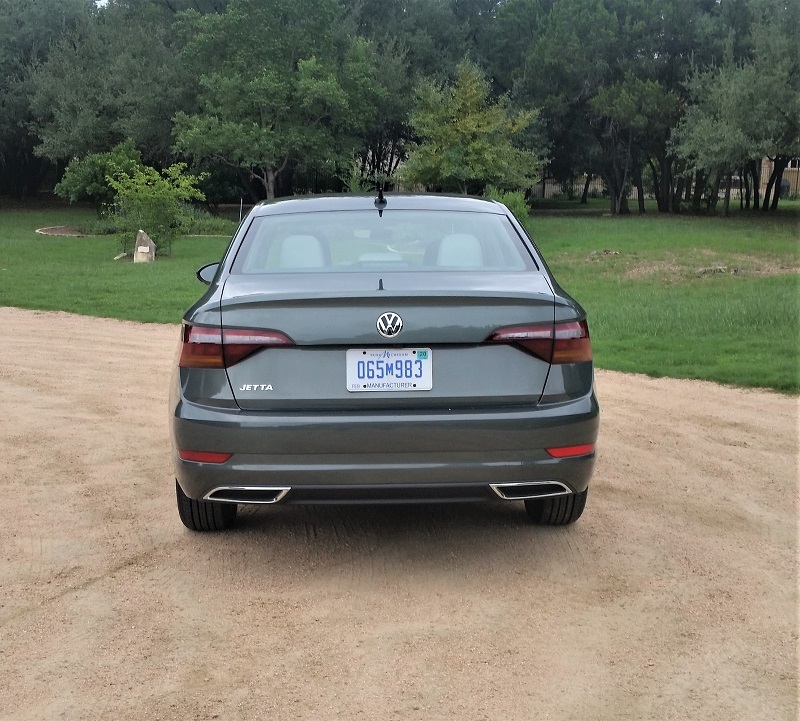 The redesigned 2019 Volkswagen Jetta is longer, wider and taller with more room inside than last year. It offers more technology and convenience while delivering better performance and fuel economy from the 1.4L turbo four-cylinder engine that is mated to a new 8-speed automatic transmission. 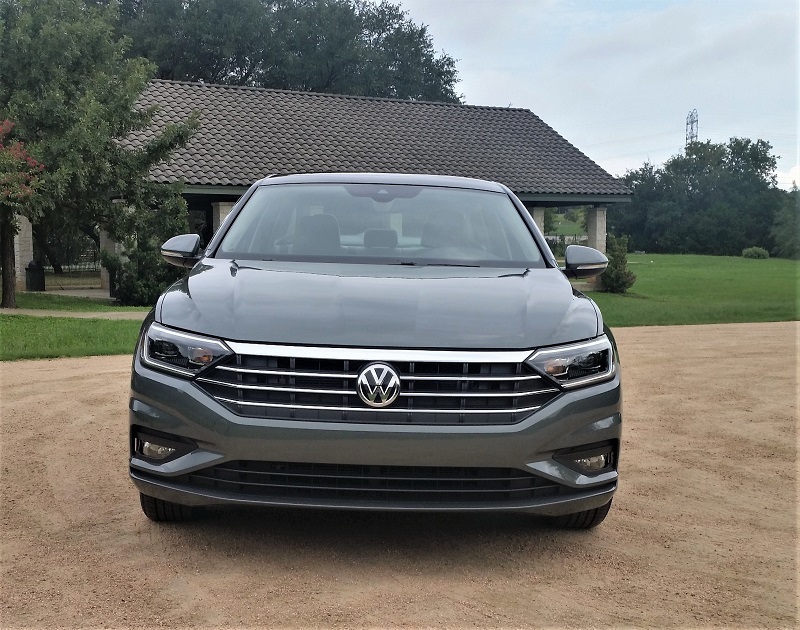 Starting at MSRP $22,155, the seventh-generation redesigned Jetta sports a larger front grille that is crisply executed and accented nicely by sporty LED lighting and chrome finishes. New bold, but refined, character lines run from front to rear and culminate in a strongly executed rear with LED lighting and spoiler. A fast-sloping roof line presents a stylish coupe-like profile that might infer a problematic low entry for rear seat passengers. 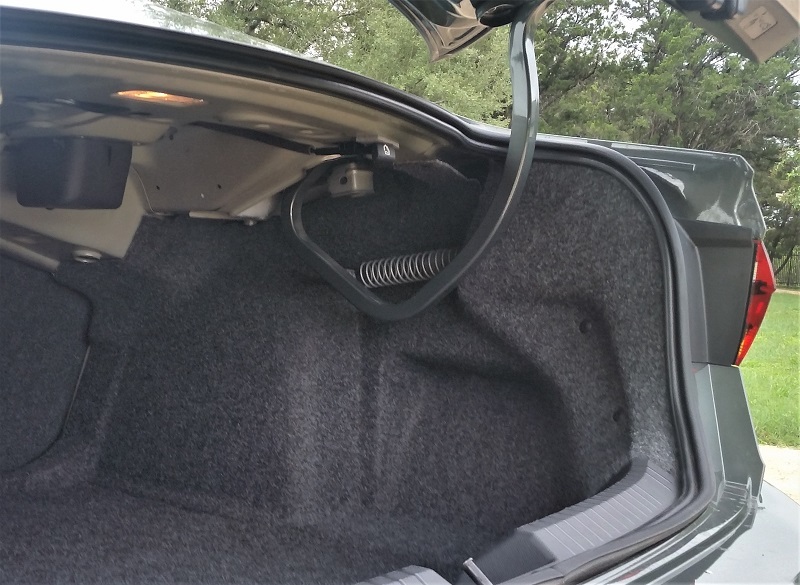 Not so, as we found the design and placement of the door, C-Pillar and rear quarter window, under the slope, does not impede access or egress from the second row. On the inside, the new Jetta presents an upscale look through simple execution of ‘equal attention to form and function’ design and materials that is then supported by latest technology. The result is a very affordable five-passenger sedan that delivers visually and dynamically for budget conscious consumers. 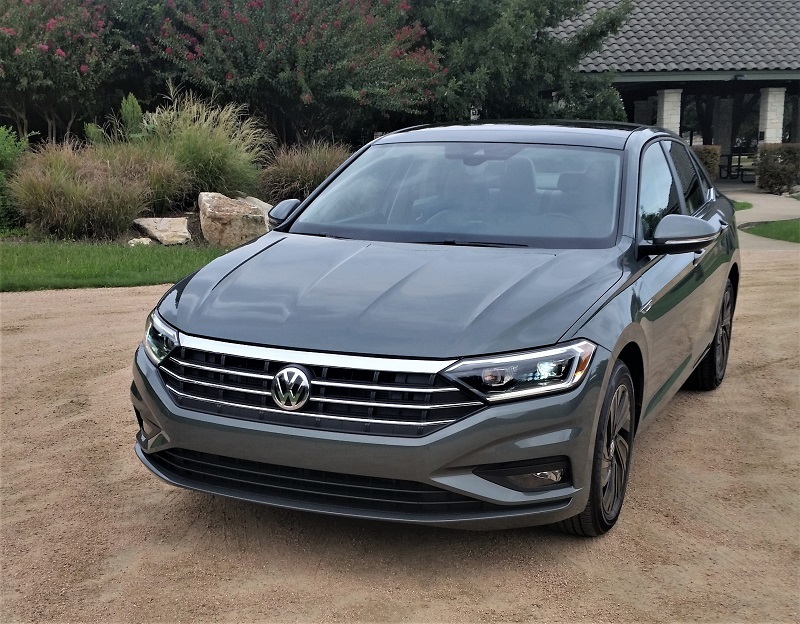 Volkswagen sent us a Sage Green Metallic 2019 VW Jetta SEL Premium with a Storm Gray leather interior. Fully equipped and ready to go – this top-of-the line SEL Premium came with a very affordable MSRP of $26,945. And for those who like one price shopping, that was it, no options, no accessories. Differing from the lower trims, it had a Gloss Black front grille instead of the standard and an R-Line bumper at the rear. Sporting muscular wheel openings, it was fitted with 17-inch Tornado Metallic wheels mounted with 205/55 R17 all-season tires. The exterior styling was further complimented by LED Projector Headlights, Halogen Fog Lights and LED Taillights. Other features of note included a Panoramic Sunroof, Rain Sensing Wipers with heated washer nozzles and heated wiper park and power adjustable heated sidemirrors with /signals. 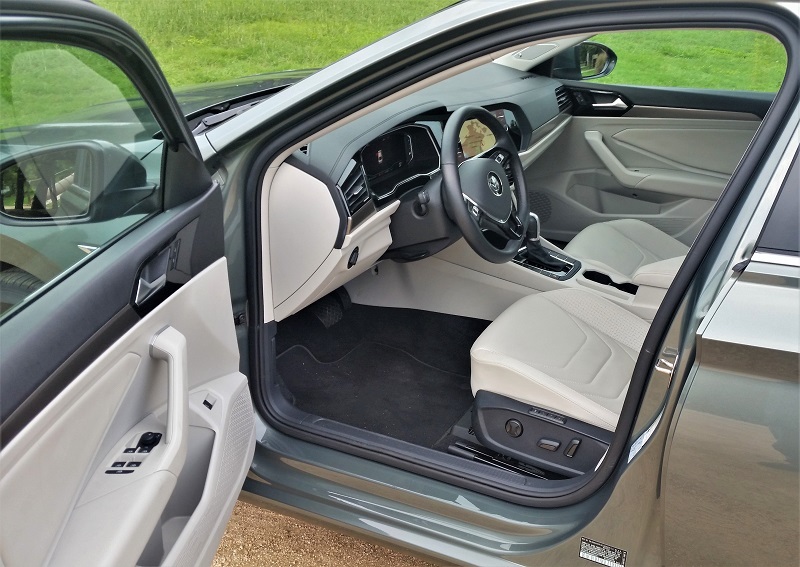 On the inside were a multi-function leather wrapped heated steering wheel, Front Sport Comfort seats with power lumbar plus 8-way power driver and 4-way power passenger adjust, heated and ventilated leather surface front seats, keyless access with remote and pushbutton start and more. 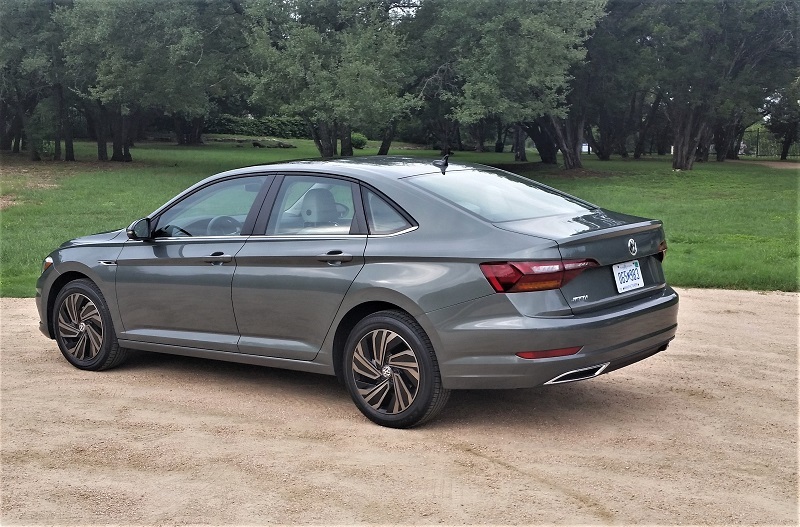 Another distinctive feature was the 10-color LED ambient lighting system that can be driver set or automatically coordinate with a selection of each of the four Jetta Drive Modes. The new Jetta is powered by the (updated) Volkswagen 1.4-liter turbocharged and direct-injection TSI engine with Variable Valve Timing. It delivers 147 horsepower and 184 lb.-ft. of torque with peak torque at just 1,400 rpm. The all-new eight speed automatic transmission offers two more gears than the last Jetta. The additional gears contribute fuel efficiency while the shorter range first gear gives the 2019 Jetta more pop off the line. A Start/Stop System is standard on automatic-transmission models. It operates pretty smoothly, but if you don’t want to bother – you can turn it off. 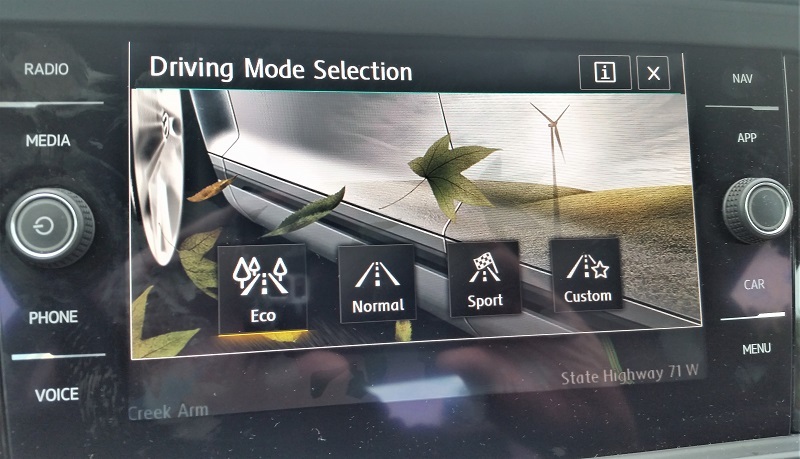 Drive Mode Select is standard on SEL trims and features Normal, Sport, Eco and Custom setting levels. Each adjusts throttle settings, shift points and steering to optimize for economy at one end and performance at the other. We found that Normal was adequate for every day. Selecting Sport, you get palpable response that enhances performance in road driving. Yes, you lose a bit of fuel economy, but the fun is worth it. Our recommendation is to use Normal around town, Sport for road driving and Eco for the freeways. 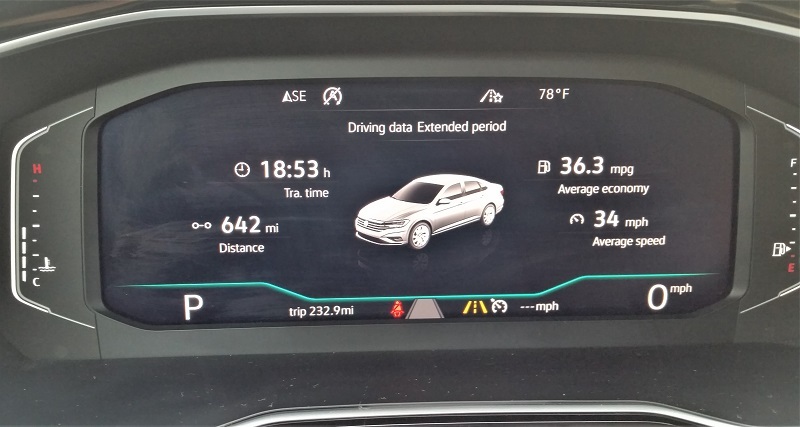 Fuel economy ratings for the 2019 Jetta are 30/40 mpg city/highway and 34 mpg combined. For 2019, Jetta is built on the VW award-winning MQB modular chassis as the Atlas and Tiguan – featuring unitary construction with two solid-mounted subframes and bolt-on front fenders. Jetta’s strut-type front suspension has lower control arms and long-travel coil springs with a torsion beam rear setup fitted with telescopic dampers. Steering is electrically power-assisted – rack-and-pinion and speed sensitive for performance. The turning circle is a nimble 36.4 feet. Braking on the Jetta is very responsive with 11.5-inch vented discs at the front and 10.8-inch discs at the rear. It is equipped with Electronic Brake-pressure Distribution (EBD), and Hydraulic Brake Assist (HBA) and an electronic parking brake. Of note, the system also has a brake disc drying feature to help remove water from the rotors to optimize wet-weather braking. 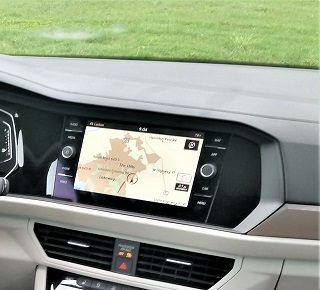 Our 2019 Jetta SEL Premium had the Volkswagen MIB II touchscreen infotainment system equipped with the premium Discover Media Unit. It featured an 8.0-inch glass capacitive touchscreen color display that enabled swiping and pinch-zooming. 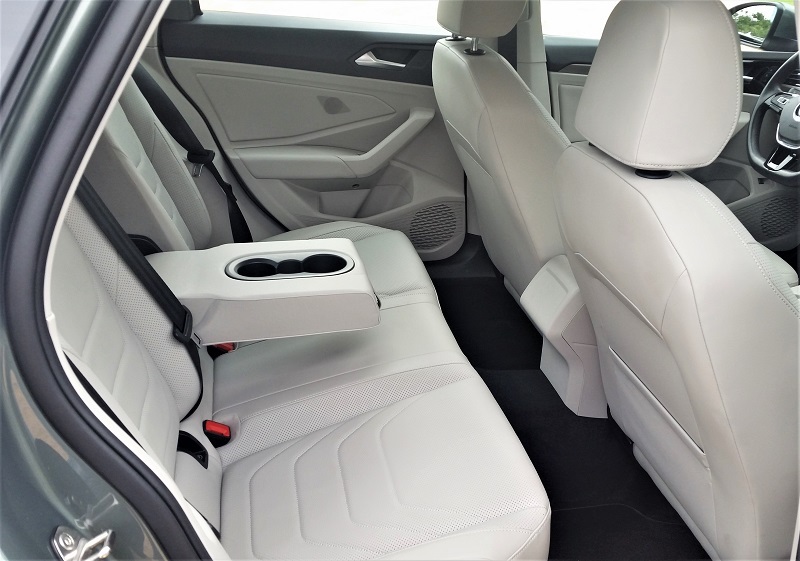 Jetta is the first VW vehicle to feature the BeatsAudio System 12-channel 400-watt audio with digital sound processor, 8-speakers and a subwoofer. We found the speakers well-placed delivering excellent sound quality. A full range of Volkswagen Car-Net connectivity system features was also included. In particular, the App-Connect standard smartphone integration supports App-Connect Apple CarPlay, Android Auto sand MirrorLink services. Car-Net Guide & Inform provides an in-vehicle Navigation system with an array of useful service features including SiriusXM Travel Link and Traffic. The Car-Net Security & Service includes Automatic Crash Notification, Roadside Assistance, remote vehicle access, remote door lock and unlock, remote honk and flash of lights, last parked location information, and remote status check (doors and windows) plus vehicle diagnostics and more. Our Jetta SEL Premium also came with the VW Digital Cockpit that provides a reconfigurable instrument-panel screen instead of conventional instrumentation. The 10.25-inch display can show key vehicle data in five driver-selectable modes, including one that positions navigation data front and center for easy viewing by the driver. 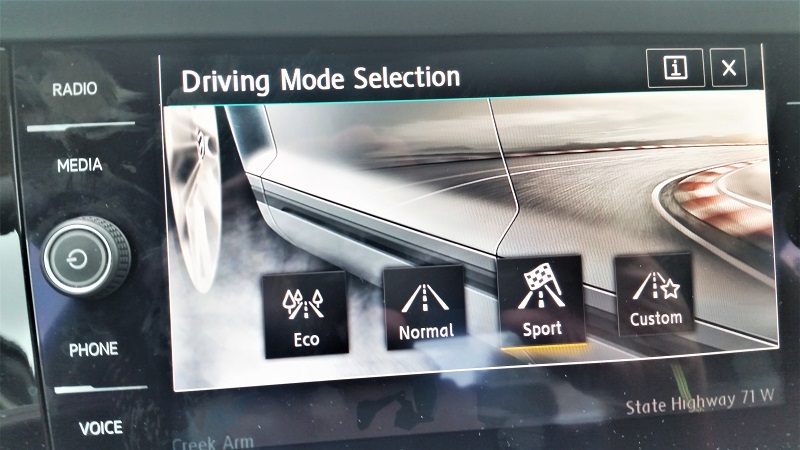 The SEL Premium also included a comprehensive suite of driver- assistance technology features. They included: Forward Collision Warning and Autonomous Emergency Braking (Front Assist); Blind Spot Monitor with Rear Traffic Alert; Adaptive Cruise Control (ACC); active Lane Keeping System (Lane Assist); plus a High Beam Control (Light Assist) which (on dark roads) automatically adjust the high beams higher at speeds above 37 mph. 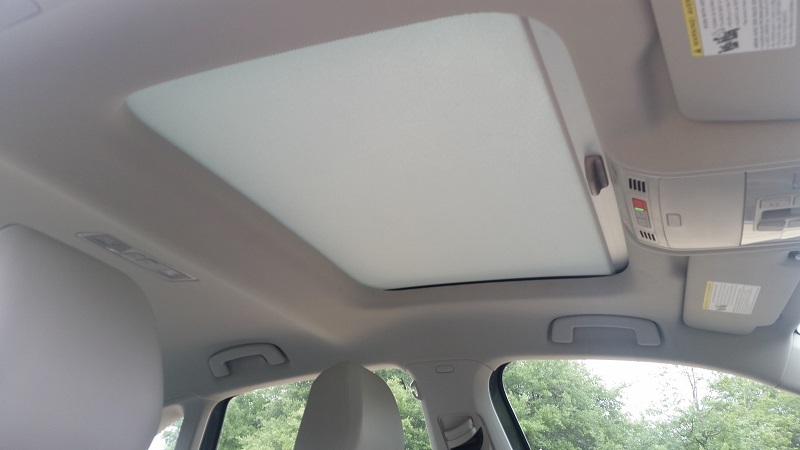 The panoramic sunroof fabric (not hard) sunscreen does not fully block heat transfer when closed. Translucent, it lets in lots of light when closed, but also lets in the heat. On hot Texas afternoons, despite AC on Recirculate, the heat on the head was distracting. Speaking of heads, the trunk lid may be an issue for some. When opening to load groceries, I found it ‘springing’ back down from the raised position as I leaned in – giving me a good bump on the head. We noted that the lifting assembly is a spring device and, if you do not fully push the lid to full upright (where it does catch), the spring will pull it back down on your head. Neither issue is a deal killer. The new Jetta SEL Premium at $27,795 in your garage is a great buy for a really good compact sedan. We would learn to cope. 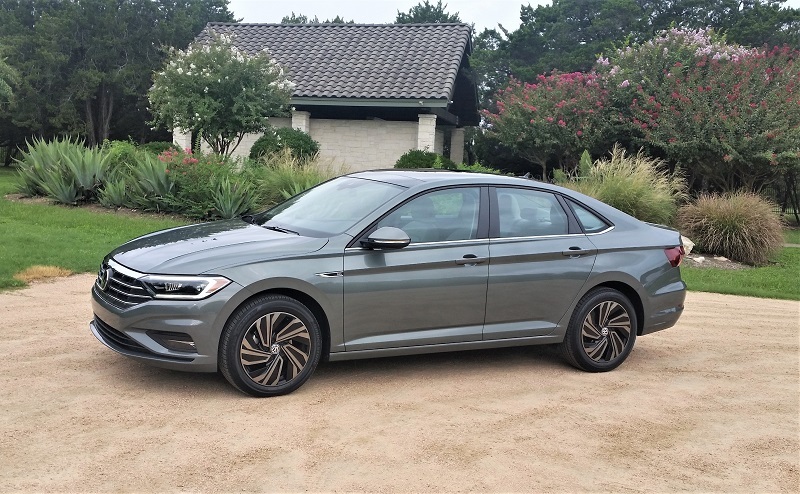 The 2019 Jetta lineup starts with the model S at MSRP $18,545 for the 6-speed manual and $19,345 for the 8-speed automatic transmission. Note: if you want the manual gearbox, the S is your only choice. The rest of the lineup includes the SE ($22,155), R-Line ($22,995, SEL $24,424) and the SEL Premium ($26,945). The destination charge is $895. All 2019 VW Jetta models come with the VW People First Warranty – a six-year or 72,000-mile bumper to bumper Limited Warranty which can be transferred to subsequent owners.